Perhaps you lost a tooth in a sports injury. Or you were in an accident or lost one due to tooth decay. Whatever the cause, getting a tooth implant is a rather simple procedure to restore your smile and your confidence and the best part is that they look, feel, and function just like your natural teeth. 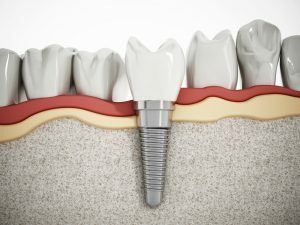 The implant procedure involves placing a post, or anchor, into the jawbone where it fuses with the bone, and then attaching an artificial tooth on the post. The entire process takes place over several months to allow for secure bonding with the anchor and jawbone. We’ve come a long way since George Washington and his wooden teeth. Today’s implants are nearly indistinguishable from the real thing. The posts of dental implants are usually made of zirconium or titanium alloys due to their strength and the fact that bone will fuse successfully with them, forming a bond that will hold the implant securely in place. The tooth part is usually constructed of a strong ceramic or porcelain material that looks like a real tooth in color and texture. Dental implants rarely have complications. 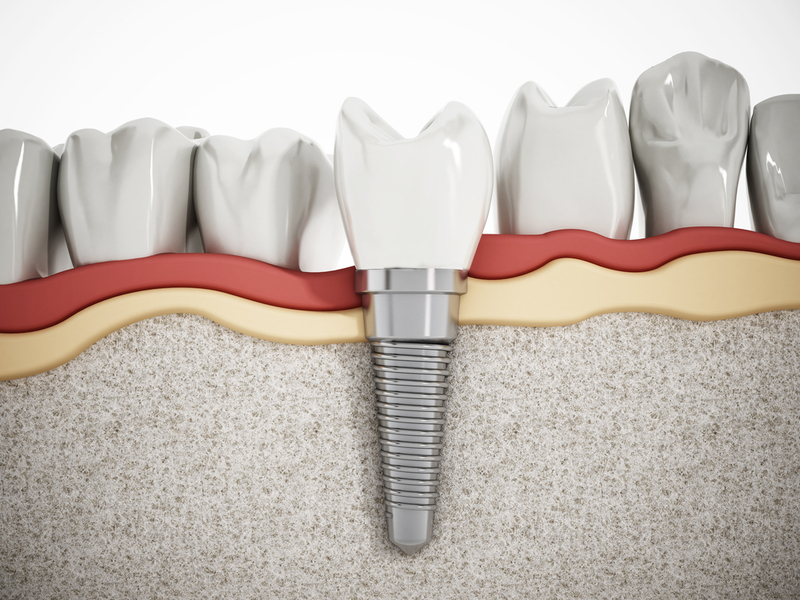 It’s a straightforward procedure with a high rate of success, especially when performed by an implant specialist. After you go through the procedure, what’s the best way to care for your implant? After all, you want it to last as long as possible and with proper care, they should last for decades. Dental implants are truly revolutionary. 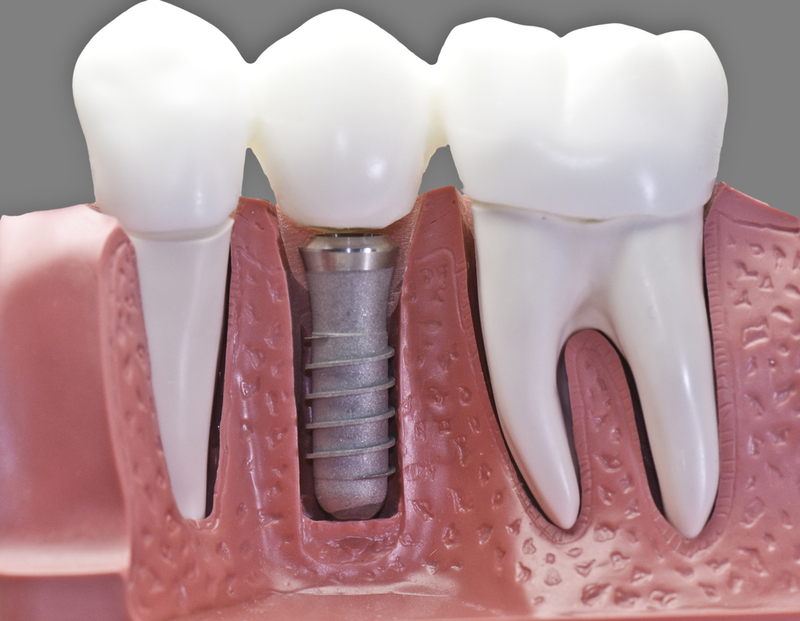 Bridges and dentures require special care to keep them clean but the beauty of implants is that for the most part, you treat them like you would your very own natural teeth. Brush twice a day and floss once daily to clear away any bacteria and plaque build-up. And be sure to schedule 2 cleanings a year and get x-rays once a year. You can eat right after your procedure is done, in fact, it’s recommended. As with any surgery, your body needs proper nutrition in order to heal itself. Softer foods are ideal initially but you will quickly be able to eat all of the delicious foods you love. Dentist showing porcelain crowns to the female patient. While your general implant care is the same as your own teeth, you should take a few precautions to ensure they last. Because the crown of your implant is made of ceramic or porcelain, use caution when switching between hot and cold foods and remember that your implant anchor is made of metal, a conductor of heat, so it may cause some discomfort if your food is too hot. Vibrating toothbrushes may cause the crown to loosen over time because it is attached to the anchor with a screw. Stick to a good manual toothbrush. No matter how difficult a package is to open, don’t use your teeth (natural or implants) to do it! Floss around your implant carefully because the nerves in that area are no longer there and you could cause damage if you floss too forcefully and could allow bacteria in around the implant. A dental irrigator works best to remove food from around your implant area. When you go for your biannual cleaning, your dental hygienist should check your file to see if you have implants but it doesn’t hurt if you mention it just in case a review of your file wasn’t done. 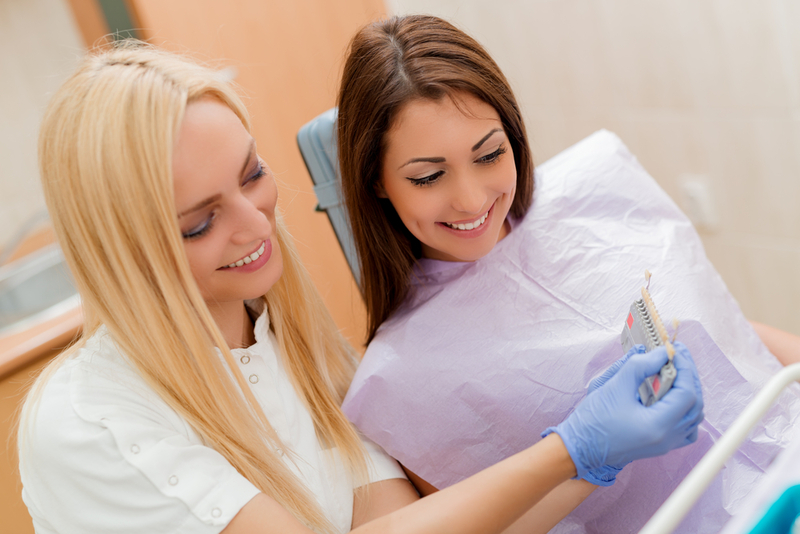 Your hygienist will clean your implant differently than the rest of your teeth. 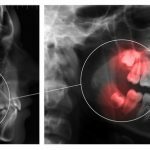 Missing teeth may not only impact how you see yourself and how others do, it can also cause your healthy teeth to shift and loosen over time. Dental implants act like the real thing which means they keep your other teeth in line. If you have missing teeth, dental implants may be the solution for restoring your smile and your confidence. Call Oral Facial Surgical Arts today at (352)243-5599 in Clermont or (407)207-8005 in Lake Nona. We’d love to make you smile again!